May 2013. New adventure in sights. 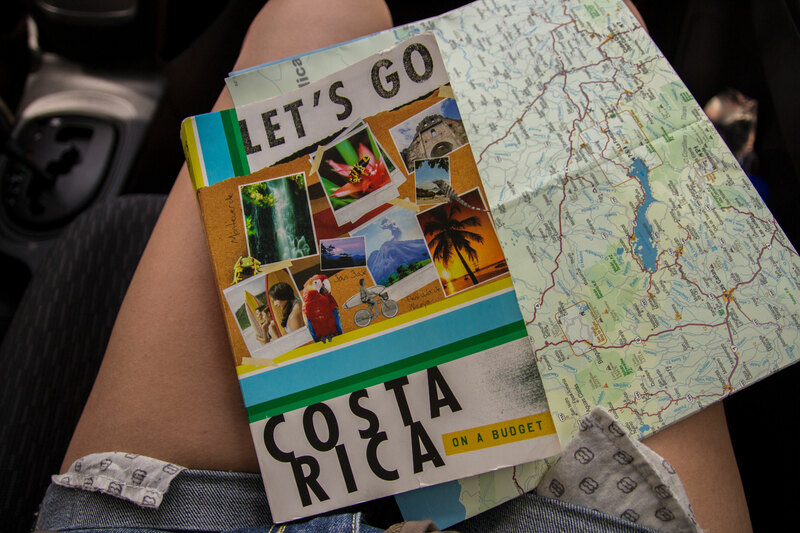 This time we set out to embark on exploring Costa Rica! We booked Westin Playa Conchal in Guanacaste province. From that launchpad, we could explore whatever is possible in the limited time that is available. No trip is undertaken without a trusty guide book and a detailed map. I like to be prepared and save time when travelling. This way, no time is wasted on deciding what to do or where to go. We arrived without a hitch and a 45 minute bus ride later, arrived at the hotel. The hotel is spectacular in size and beauty. However, tripadvisor has all the reviews you can read and this blog is certainly not about the hotel. We decided to explore the hotel grounds (enormous) and then rent a car and then set out from the confines of the hotel. The hotel is a lush, tropical paradise that had various types of animals living on the grounds. This was my dream come true. I made Elena go around so much on this trip that she was mocked at work for coming back without a tan. Sorry Elena! If you set out to explore the grounds and the beach, take note to bring bug spray, it is a necessity. I was shocked to see so many people suffering from the sand flea bites and mosquitoes. This is a tropical country! There are insects everywhere, so be prepared. Another necessity…. 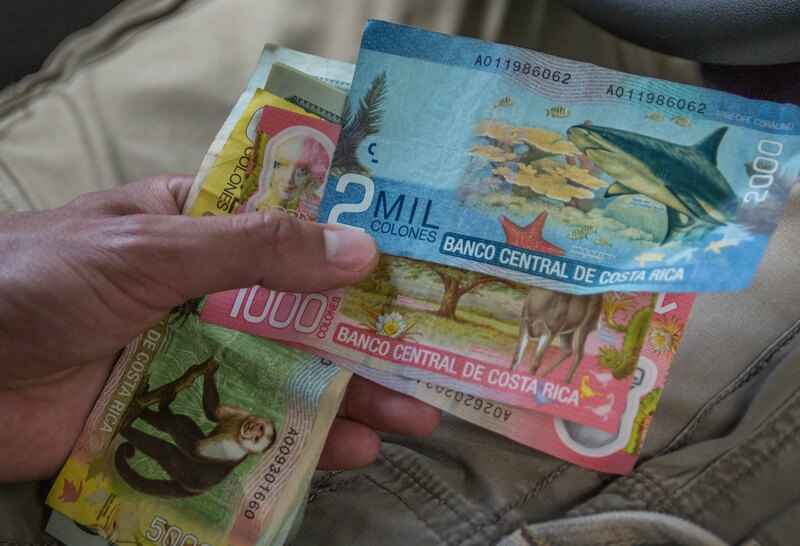 Costa Rican currency “colones”. The most colorful and beautiful designs in my opinions. I wish other countries would introduce a shark bill. How sweet is that? Tip: try to avoid changing all your gringo money at the airport as their exchange rate is a bit high. Banks are the best bet. Multiply the amount by 2. So for example you have 1000 colones (1 x 2 = 2 US dollars), 2000 colones (2 x 2 = 4 US dollars) and so forth. Someone might find it useful. Our first hour in Playa Conchal. We sat in an open lounge that had white cloth hanging down from the ceiling and on it I found this amazing beetle! I have been searching for a Rhinoceros beetle since I became obsessed with insects. (some 25 years). Rhinoceros beetles are some of the most beautiful insects in the world. Unfortunately, their beauty comes at a price as they get captured and made into display items so someone can proudly put them in their vanity cabinet as art. Well, I named this guy Richard. His horns were strong and resembled swords. He was also very strong and trying to keep him in a closed fist is quite a challenge. So I named him after Richard the lion-heart. He became our pet. We fed him fruit from the buffet. He was a real stand up guy! I was on a mission 24/7 to find all the wildlife that surrounded the hotel and squirrels were everywhere. Now, these are not the North American scraggy, mangy rat things. These guys had a thick black and orange fur and were a ball of energy. These critters are very inquisitive and are busy all day long running up and down trees. The also somehow adapted to maneuver through thorny bushes without getting prickled. They are also able to crack open a coconut. 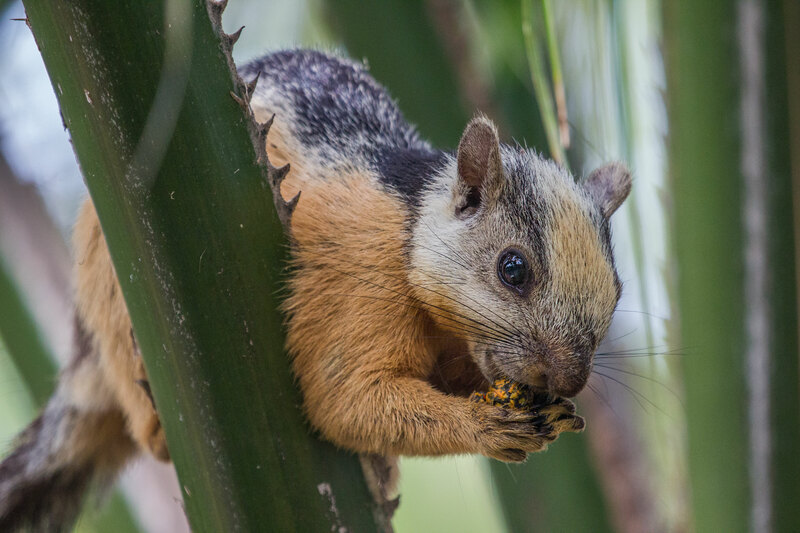 They are seen at all times of the day, looking for a snack or defending their favorite tree. If you are bold, you can attempt to touch them as they are not shy and will not scurry away as their northern counterparts. However the were not the only common residents of our hotel. There was another strange looking animal and it was….. Coatimundis!!!! 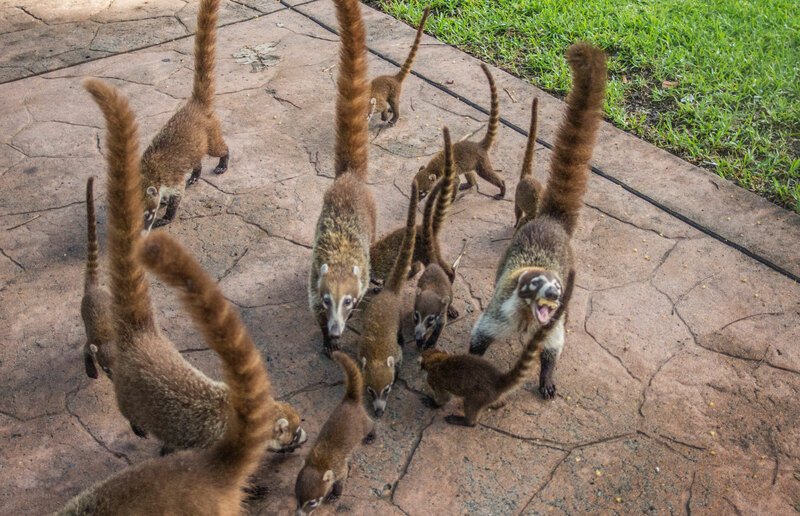 These playful animals are part of the raccoon family and are seen roaming the grounds of the hotel in huge families. All the adults in the pack are females that are raising their young. Males just come in for the business part and leave. Coatis are very mischievous and playful and will inspect and touch anything they come across. The hotel has many signs urging people to avoid feeding them but that is not necessary as most people avoid them anyway. Elena could not resist the temptation of feeding them so it turned into a daily ritual. We would save the food from breakfast and then wait for the horde of cuteness to come. It was awesome! I have read about a tour guide that was on the beach every single day and that you couldn’t miss him. After chatting online with the guy and arranging to meet, I was skeptical about him being there. I was wrong….. Eric is right there, on the beach, beside the hotel entrance. Always smiling, always looking to help and offer advice. Usually, we like to explore alone however Eric was so nice and informative that booking a tour with him seemed right. We booked a tour of waterfalls, ride to a farm on a volcano and then inspection of Miravailles volcano complete with mudbaths. We got his best guide, Rigo Suave. 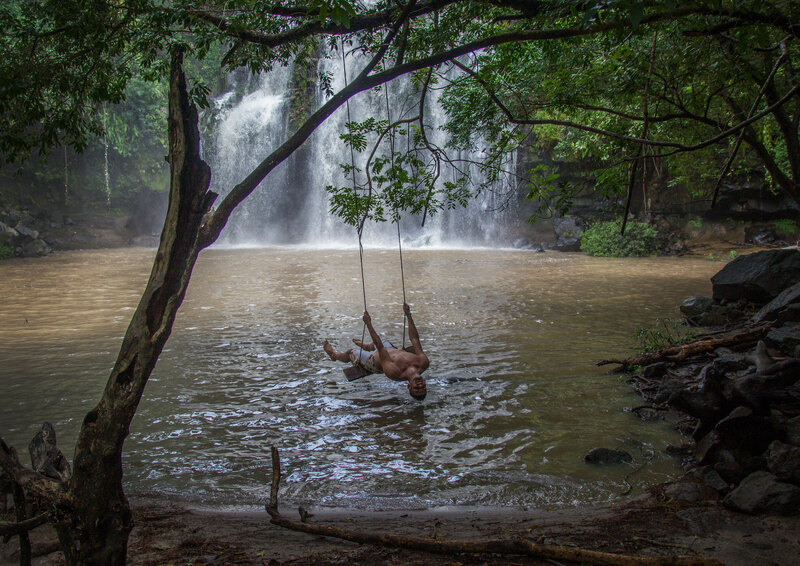 This man is hands down your best bet should you decide to take a tour in Costa Rica. His passion regarding his country is inspiring. Wealth of knowledge about flora, fauna and history. We had a small challenge who could find the most animals and birds and I’d like to think we were tied at the end. We started off by getting stuck in traffic for two hours but it was still great time as we discussed everything from politics to history. Our first stop was this chocolate river. 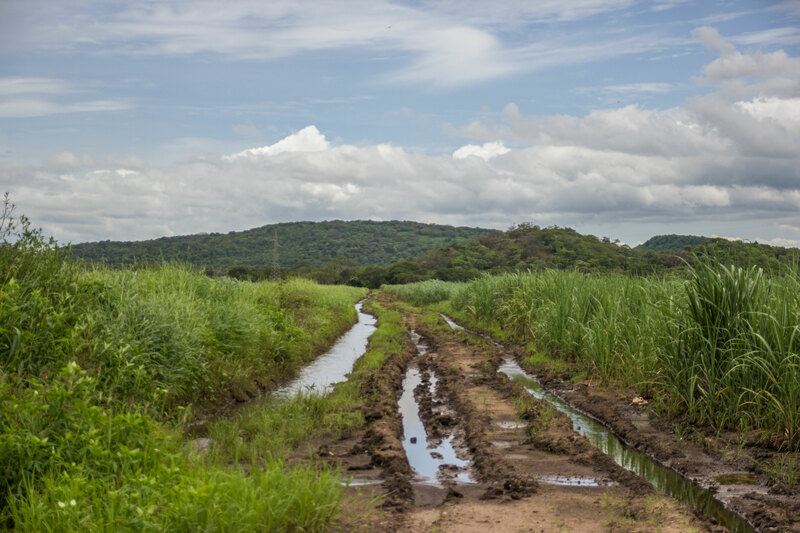 This was rainy season and torrential rains carried a lot of soil downstream. The water became chocolate colored and no one wanted to get dirty. There is something magical about nature when it is free of people and their interference. The water was very cold and dirty but free of people! Elena and I got it and even managed to get to the actual waterfalls to stand underneath. I miscalculated the force of falling water and got a nice scratch from it. If you are reading this and consider going somewhere amazing, please remember that another opportunity might not be present again. So jump in the water, explore trails and try new foods! 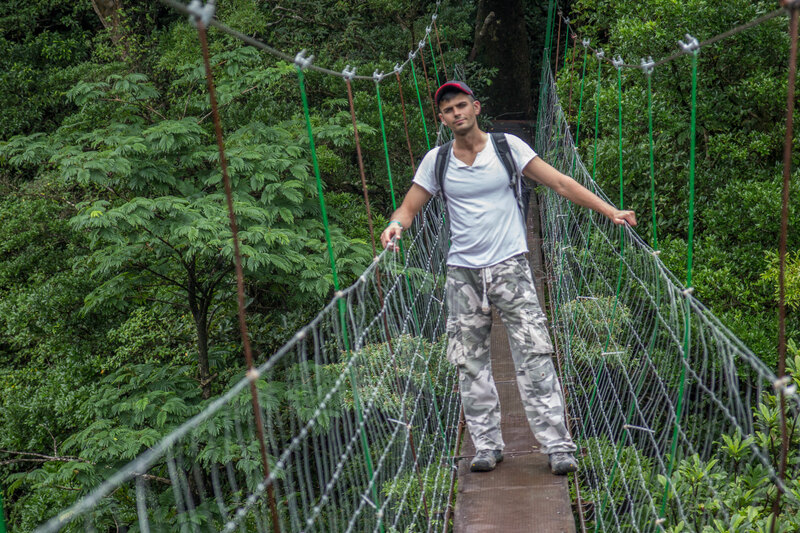 Our next stop was exploring the hanging bridges in the jungle. The sounds,smells and sights are enough to overdose on emotions. We did not stay long as the trail was short and we were falling behind the schedule. The ride to Miravailles volcano was in a tractor. Unfortunately, it was full of people that complained about the heat, the bumpy ride. I asked Rigo if we could walk instead. A downpour started and a few seconds later we were drenched through. As quickly as it started, it ended and sun`s rays pierced the dark clouds. I noticed green parakeets completely drenched. They sat on trees looking so miserable. I think if ad firms wanted to bring pity and sadness out of people, all they have to do is show some pictures of drenched birds. They look very miserable indeed. We enjoyed the walk back to the farm as it gave us a chance to take in all the sights at a leisury pace. I wanted to find a scorpion and overturned every rock that came up. No scorpion this time but a nice looking tarantula was found! Elena also photographed a hawk. We had a hearty meal of meat, rice, veggies and juice and got going to the mud baths. Along the way, Rigo shared his wealth of knowledge about volcanoes, hot springs and geology. As we got closer to the mud baths, putrid smell started to follow me. It smelled like rotten eggs. At first, I thought maybe it was me sweating. No chance! It was the sulfur from the volcano. Well, we got to the mud, got naked and went crazy. I even had it in my ears. The procedure is this: you smear yourself with the mud, then go into the sun to dry out and then once the mud cakes, you wash it off under very erotically graphic showers. The water flows from….Well, you get the idea….. Overall, it was an exhilarating tour and I highly recommend Rigo Suave. We got back to the hotel and the rotten egg smell stayed with us for another few days. Shower, ocean and chlorine from the pool were powerless against the volcano. It was all good though! About 2 kilometers from the hotel, there was a river that ran parallel to the ocean. Rumor had it that it was infested with crocodiles. We went there almost every day but no crocs were seen. Maybe they were shy or I just smelled like rotten eggs. While searching the river bank for the elusive kingfisher (my nemesis), I left Elena by the ocean. After sitting in ambush for quite a while, I realized I haven`t seen or heard her. That was not very smart of me. I got out from the bush and set out to find her. No need as she was running towards me, gesticulating and yelling something. I am quite deaf so no words reached me. 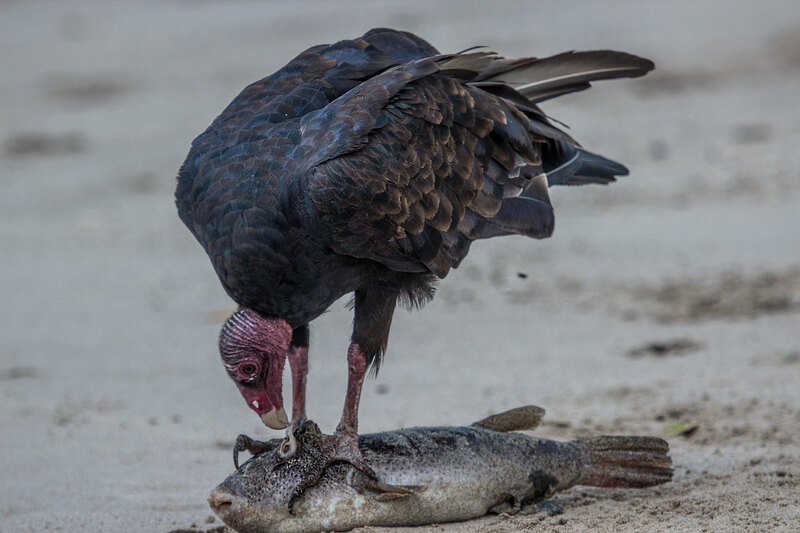 While I was sitting in the bush, she found a vulture that swooped down for a meal of sushi. The bird was obviously hungry as Elena was able to get very close. In order to get an action shot, she wanted the bird to do something. So Elena started to flap her arms to get some kind of movement from the bird. Well, the vulture was not impressed and started to attack Elena. It was quite a sight. Elena running around the beach and a vulture flying behind her. Our river and hotel exploration behind us, we rented a car to explore the vicinity. We rented a small car thinking it would be low on gas and easy to get around. Our goal was to explore all the beaches around Playa Conchal and go beyond. It is an amazing feeling knowing that every turn you take will lead you to a new street, new sights and new adventures. Each beach has a different feel to it. Some are more surfer oriented, others are for lounging around. The people differ too. As you veer off the road to explore another beach, you venture into the unknown. We saw a Jamaican patty shack on the beach, middle aged men offering us drugs, yacht paradise, turtle beach, surfers waiting for the wind to pick up. At one particular beach (can’t remember the name), there wasn’t a soul in sight. We were completely and utterly alone. All of the sudden a boy pulled up beside the car with a cart and offered us some coconuts. We must have been his only sale of the day. I think he was as shocked as we were to see another person. We drove to Liberia and found a cool greenhouse cafe to eat. It was literally a restaurant in a greenhouse. Yes, there were bugs around, yes it was humid but the food was great, service efficient and beer cold. That is a recipe for a success in my mind. The next day, we set out to Palo Verde park. Rigo told us about river tours that the park offers which allow you to see monkeys, crocs and other animals. We drove past Liberia and on to Canas. The map showed a right turn onto a dirt road that we had to follow for 20k in my estimation. 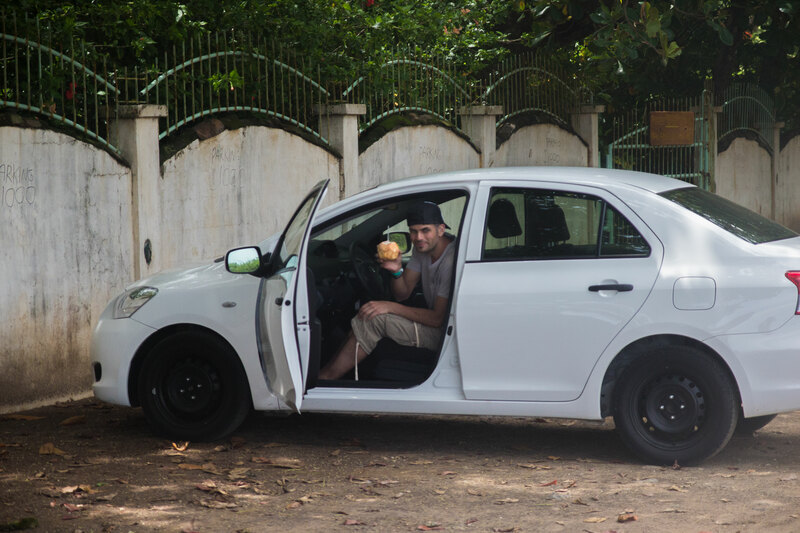 That is when we realized that small cars like the one we rented are not suitable for the Costa Rican “massage” roads. The roads are not gravel or dirt. They are boulder rock types. Our little car was jumping up and down for about 2 hours. There was no way, I could have gone more than 15km per hour. I was praying that the suspension will hold out. No signs were visible that would direct us towards the park so we continued on the assumption that the road will finish someday. Occasionally there would be perpendicular road like the one below. Driving on that road in our little box would be impossible. Maybe if we carried the car on our back? Three hours into dirt road adventure, we stopped because I had to admit we were lost. I made the decision to drive just a bit more and if no sign magically appear then we can turn around. I started the car and not even five minutes past, there was a big sign with an arrow pointing towards the park! We drove through the gates. There was a sign with price breakdowns depending on stay. I looked through a dirty window into the ranger cabin but other than spider webs, no signs of life were present. So rather than stay and wait to pay, we drove right through. The nice dirt road from the ranger outpost gave way to another boulder road. NOOOOOOOOOOOOO. Oh well, I took a left and we got lost. Again. We were now in the middle of the jungle with half a tank of gas, a can of beer and half a bag of chips. Should be enough! All of the sudden a van full of tourists zips past us and the people were all shocked to see us in our small box car. We continued on and were stumped to find out that the road was washed out from the rain and there is no way our car could make the uphill trek. That is when we admitted defeat and turned around. To go back to the Costa Rican “massage”. The road back was uneventful apart from the ranger that appeared at the gates and tried to block us from leaving with a plastic pylon. He wanted $20 per person or we wouldn’t leave. I gave him $10 and drove over the pylon. On the way back, I tried to take a shortcut but it got dark quickly and in unfamiliar surrounds, without lights, I was lost. I saw a restaurant with three tables and a small black and white tv. There were some people huddled under the roof, watching a soap. 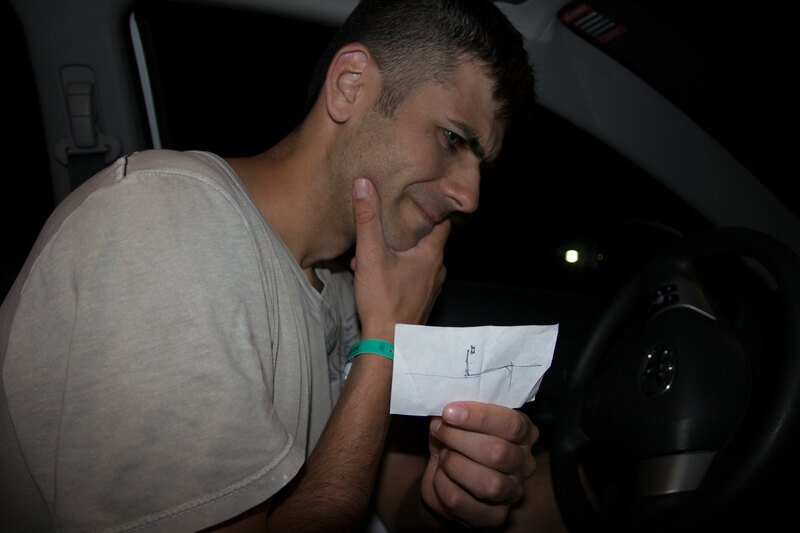 I got out to ask directions to the hotel and one of the patrons offered to draw me a map to get back. Interestingly, the map was correct and we got back to the hotel defeated and exhausted but safe and sound. The next day, we recovered from the very interesting Palo Verde park and lounged around the hotel. In the afternoon, we drove to Tamarindo. Tamarindo is a popular tourist enclave full of tourists. There were restaurants everywhere, gift shops and surfing rental shops.English was spoken everywhere.If you ever stop in Tamarindo, do visit Witch Rock surf camp. It was founded by Robert August. The surfer from the cult surfer movie ” The endless summer”. I actually met him and got his autograph there. Witch rock offers board rentals, has two restaurants and is a hotel as well. Our favorite place in Tamarindo hands down. 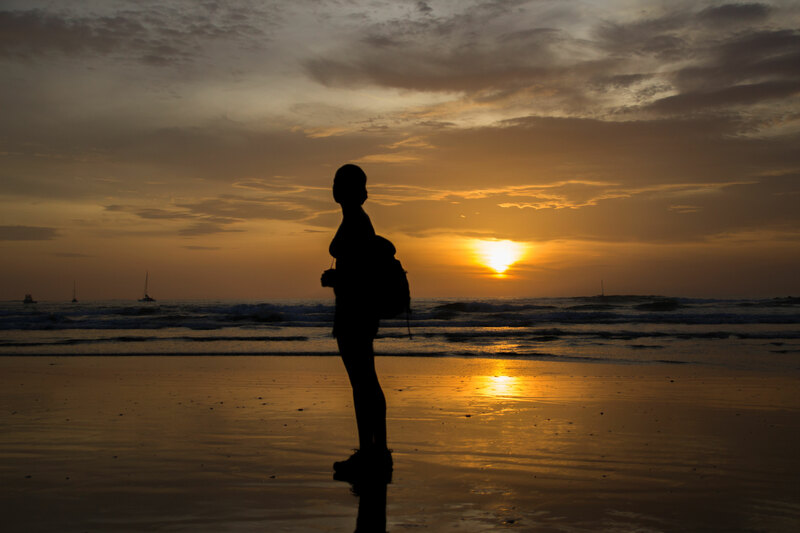 We fell in love with Tamarindo sun set and promised ourselves that we will be back…. 6 months later, we were back.